Hey all- Amita here with today’s #BigSell30. We’ve got a few more days left of our month long challenge of trying out one new piece of pop culture everyday. When I was preparing this post to Big Sell this article, I told Sean I would try to avoid selling another song or album, which I must say was harder than I thought since I’m always listening and discovering new music and want to share it with everyone! (see Lake Street Dive & Rationale). But when I saw this article and where it lead me to, I had to make a tiny exception. And technically, it’s not really a song. It’s a really fun game! So, this Big Sell comes from another Big Sell. When we were promoting #BigSell30 in late September, my cousin Sanat Patel tweeted us a great article from fivethirtyeight about the most sampled song in history. “Amen, Brother” by The Winstons has been sampled over 2,000 times over the last few decades! Artists who have used this popular sample include N.W.A., The Prodigy, heavy metal band Slipknot, Janet Jackson and David Bowie. It is a pretty interesting read and gives a ton of info about the history of this particular sample- check it out here. Thanks cousin! I have to admit, I got a sample education and the article cited another website as the source for its sampling data- WhoSampled. I had to look into this info site and find out more. As fivethirtyeight describes, “Every day, fanatical music lovers identify hundreds of samples from songs old and new and add them wiki-style to the database” and then the staff at WhoSampled vets each submission before entering it on the site. We’ve all heard a ton of samples throughout the years and it’s pretty awesome to go to a site or app to find out where the original sample came from. But the game that I discovered on WhoSampled takes it to another level- and immediately became my Big Sell! On their home page they promote a fun, music info game called, Six Degrees of Music Separation – a play on the movie themed game Six Degrees of Kevin Bacon. I was immediately intrigued. This game prompts you to enter two artists and they have some crazy algorithm that figures out how many degrees they are separated by using remixes, producers, covers, samples and more! 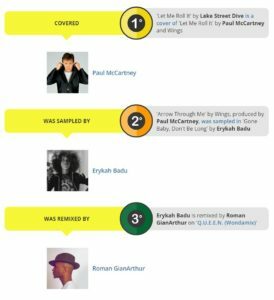 I put it to the test using two of our Big Sells: Lake Street Dive and Roman GianArthur- check out the results- did you know that Paul McCartney and Erykah Badu would make that connection? Only a few days left of The Big Sell 30 Day Challenge! Be sure to Tweet us @PopInsiders to let us know how #BigSell30 is going for you and there is still time to send us a big sell!